Land's memoir is not particularly artful. The narration advances with some circularity; the language is often stale. But her book has the needed quality of reversing the direction of the gaze. Some people who employ domestic labor will read her account. Will they see themselves in her descriptions of her clients? Will they offer their employees the meager respect Land fantasizes about? Land survived the hardship of her years as a maid, her body exhausted and her brain filled with bleak arithmetic, to offer her testimony. It's worth listening to. Cleaning houses, Land unsurprisingly reveals, is grueling work � physically painful, often disgusting, frequently underappreciated. She spends her days polishing, wiping, dusting, vacuuming, scrubbing. Face ashen, eyes dark-circled, clothes shabby, various body parts aching, she works even when she's sick.... The book brightens when Land writes about her much loved daughter and the time they share when Land has days off and energy to play. She stays optimistic about their future, taking online classes, maintaining a blog and dreaming of becoming a writer. Land's story is not defensive, but it is a defense of sorts � an unapologetic account of how a smart, talented woman ended up a homeless mother, in and out of bad relationships, and reliant on public benefits and meager pay earned by cleaning houses.... One of her book's strengths is illustrating the perverse incentives for domestic-abuse victim... Land is an expert in her own story, and she wisely sticks to it.... Not much actually happens in "Maid" except a lot of brutal hours scrubbing appalling bathrooms and some truly bleak scenes of relational discord. Yet the book, with its unfussy prose and clear voice, holds you.... Land doesn't indulge in diatribes or bog the pages down with obligatory data.... "Maid" isn't about how hard work can save you but about how false that idea is. It's one woman's story of inching out of the dirt and how the middle class turns a blind eye to the poverty lurking just a few rungs below � and it's one worth reading. MAID is a memoir written with such immediacy that you'll find yourself rooting for the author right through to the very end.... As Stephanie continues to tell us her story, we are curious to know what steps she will take next and if she will survive living paycheck to paycheck.... We want Stephanie to achieve her goal of becoming a writer, because her story gives us inspiration. If you follow your dreams, life won't steer you wrong. By holding MAID in your hands, you know that Stephanie's dream did come true --- and yours can too. Land describes the work she falls into with the kind of specificity and detail that are more frequently employed in descriptions of surgery or dance: Cleaning left to right, top to bottom, room by room, Land sketches the choreography of drudgery.... On the other hand, there's an oddly rich vein of observation available to the domestic worker with writerly instincts... 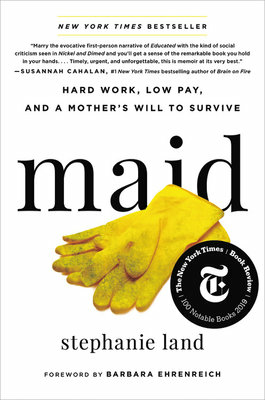 In Maid, Land displays a keen eye for how her clients live, what their houses say about their lives.... More than any book in recent memory, Land nails the sheer terror that comes with being poor, the exhausting vigilance of knowing that any misstep or twist of fate will push you deeper into the hole. Thankfully for Land  and for readers, to be honest  a few circumstances break her way, and her years of work begin to pay off.